Learn how to make Instant Pot yogurt and discover all the tips and tricks out there behind that magic button. Incredibly simple-to-make Instant Pot yogurt tastes smooth, creamy, and decadent, like eating a bowl of whipped cream without the calories! This Instant Pot yogurt recipe has been a complete GAME CHANGER for me. 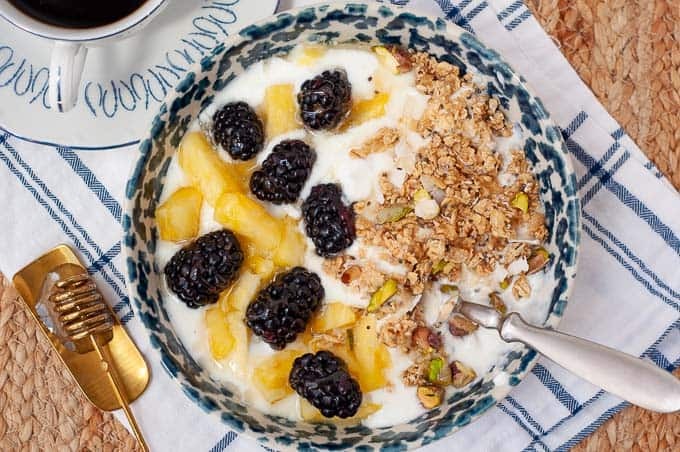 Yogurt used to be just a vehicle for toppings, such fresh fruit, homemade chocolate granola, or blueberry maple syrup. Then I finally entered the world of Instant Pot…and completely ignored that yogurt button on it. Evidently Instant Pot doesn’t know you can buy yogurt already made. But I got to thinking…I spend a lot of money on fancy organic yogurt every week. Even with the organic label, some of it still has a lot of added sugars and unfamiliar ingredients. So I asked my hippy, au naturale sister about it because, if she finds the time to make homemade marshmallows, keVita, and hydrosol lavender spray, I’m sure she’s tried her hand at homemade yogurt. Not only is Instant Pot yogurt ridiculously easy, way more economical than buying yogurt, but it’s hands down THE BEST YOGURT YOU’LL EVER TASTE. How Can You Be That Gaga Over The Taste of Instant Pot Yogurt? Because it doesn’t even taste like yogurt! It’s INFINITELY more creamy, less pungent, and insanely smooth tasting. It’s like eating a bowl of whipped cream without the empty promises to start a cleanse after. What Do I Need to Make Homemade Yogurt? Instant Pot – Some Instant Pots have a simplified yogurt button, like this one. It will countdown the time and make sure it stays at the correct incubation temperature. The Lux Instant Pot doesn’t have a yogurt button. If you have a Lux Instant Pot without the yogurt button, you can still make yogurt! Scroll down and I show you how step-by-step. Thermometer – An inexpensive one will definitely do the trick. If holding a thermometer is a little too taxing for you (no judgment here), you can also the creme a la creme Mac Daddy of them all – a Thermapen that reads in 2 seconds (LOOOOOVVVEEEE mine). Cheesecloth – You can buy cheesecloth at a grocery store, but I absolutely love these ones from Amazon. You get a ton more for the price and they are washable and reusable. Strainer – Any kind will do. Just set strainer lined with cheesecloth over a bowl to catch the whey (watery part separated from yogurt) and you are good to go. STEP ONE: Pour milk in Instant Pot. You can use whole, 2%, or skim. STEP TWO: Press “yogurt” button until “boil” shows on screen. After about 30 minutes it will start to be and the screen will switch to “YOGT”. STEP THREE: Now it’s time to bring the yogurt from 180ºF (82ºC) down to 110-115ºF (43ºC-46ºC). You can simply remove the Instant Pot insert and let it sit on the counter for about 45 minutes, stirring occasionally (make sure to keep checking temperature when you stir). Alternatively, place the insert into a bowl of ice water, stirring for about 5 minutes, or until temperature reaches 110-115ºF (43ºC-46ºC). STEP FOUR: Add the yogurt starter (scroll down for suggestions on what kind to use). STEP FIVE: Whisk to combine milk with yogurt starter. STEP SIX: Press “yogurt” button until timer reads 08:00 (it will then go to 0:00 and count up to 8 hours). You’ll know when it’s done because it will be thick and gelatinous. If it isn’t, process for another 1-3 hours. STEP SEVEN: When yogurt is done fermenting pour into a strainer lined with a cheesecloth. Make sure there is a bowl underneath to catch the whey. 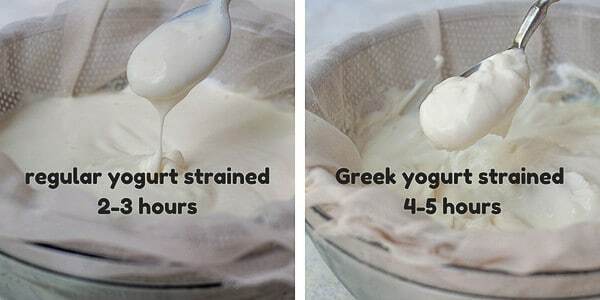 Strain for 2-3 hours for standard yogurt and 4-5 hours for Greek style yogurt. What is the best Yogurt Starter to Use? When I initially experimented with Instant Pot yogurt, I noticed I would occasionally get a grainy texture. The taste was still spot on, but the texture threw me off. Some research brought me to a great article explaining why. When additives are in your commercial yogurt starters, such as pectin, inulin, cornstarch, and gelatin, it can yield a grainy yogurt. Read the labels when using a commercial yogurt as a starter. Only use one without additives, such as Fage (even some organic brands have additives). Or, use your own starter from a previously made batch of Instant Pot Yogurt. When you’re done making yogurt, freeze a couple tablespoons straight away for your next batch. You won’t have to try to remember to save some before you finish all your yogurt. Plus, it will save you from buying commercial yogurt each time. Freezing homemade yogurt starter also insures the bacteria and cultures stay fresh and alive until you are ready to make yogurt again. Sounds kind of creepy, but it’s true. Can I Make Instant Pot Yogurt if I Don’t Have a Yogurt Button? Heat the milk on the stove or using “saute” function on Lux Instant Pot. 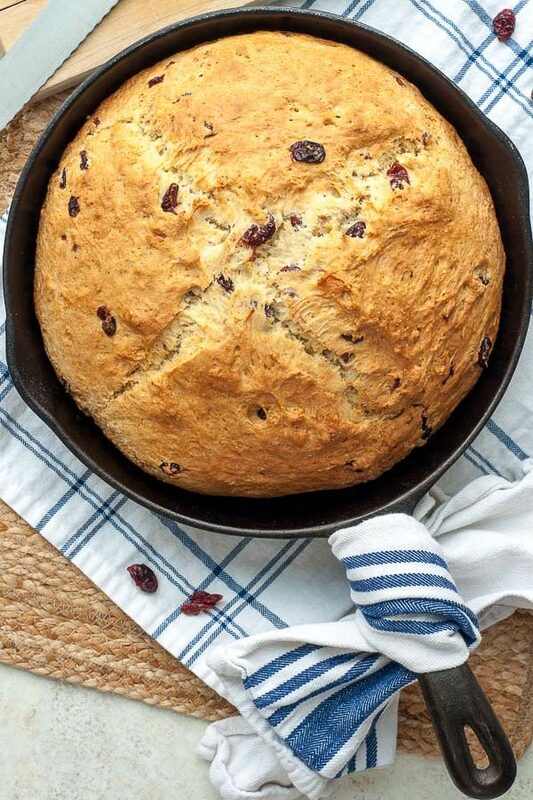 Using a thermometer, heat milk until it reaches 180-185°F, whisking occasionally to distribute heat. Place insert with cooled 110-115°F milk back in instant pot, which should be turned off. Make sure the lid is secure and vent is closed. 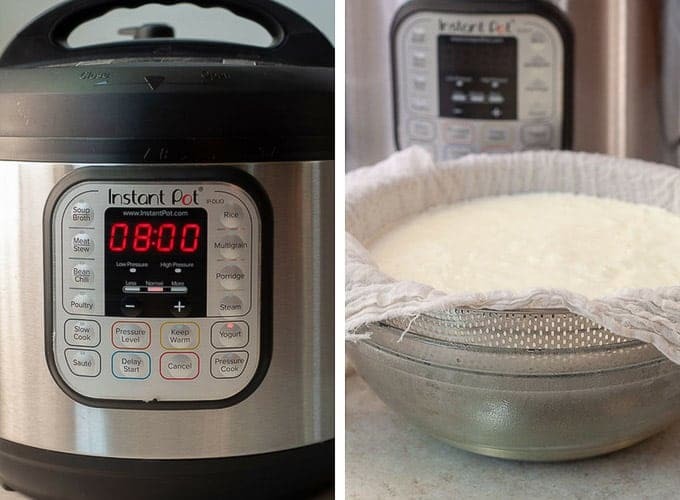 Wrap the WHOLE Instant Pot with a large towel to insulate and make sure milk stays at the correct temperature. Let sit for 8 hours or overnight. Congratulations! You’re A Total Granola Who Makes Their Own Yogurt! How about really leaning into your new way of life and make some granola? Vanilla bean paste (so freakin’ delicious) or vanilla extract – mix in 1 tablespoon per batch and then ladle into storage containers. 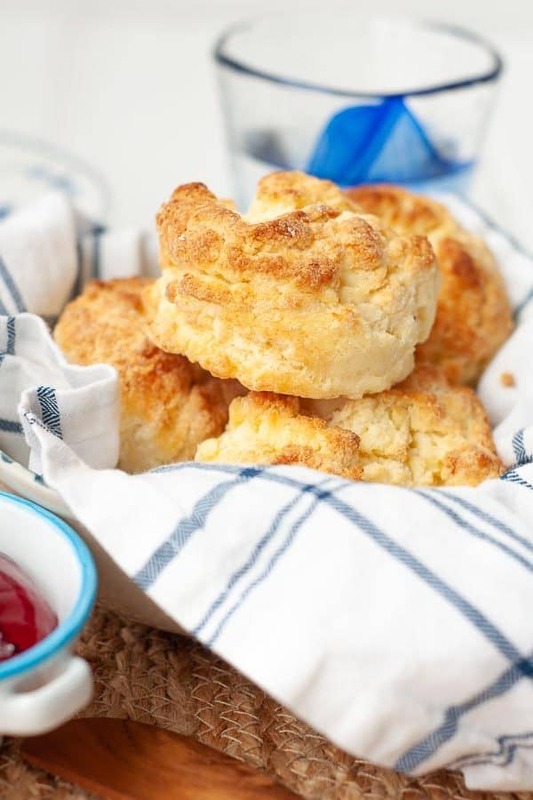 Honey or Maple syrup – You can drizzle on as it’s dished into bowls or sweeten the whole batch at once. 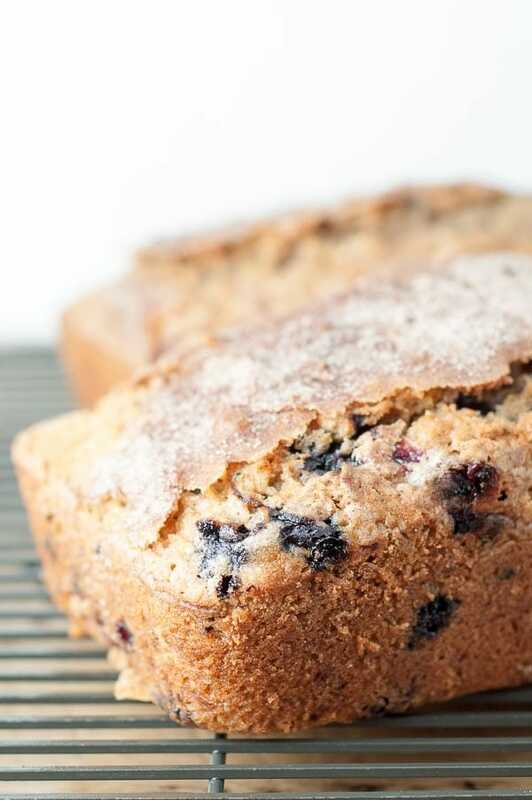 Start with 1/4 cup per batch and add 1 tablespoon at a time until you reach desired sweetness. Before making the yogurt, sanitize and clean your Instant Pot with a kettle of boiling water. This will get rid of any previous dinner smells and tastes you don’t want permenating your batch of delicious yogurt. You can use whole, 2%, or skim milk to make Instant Pot yogurt. 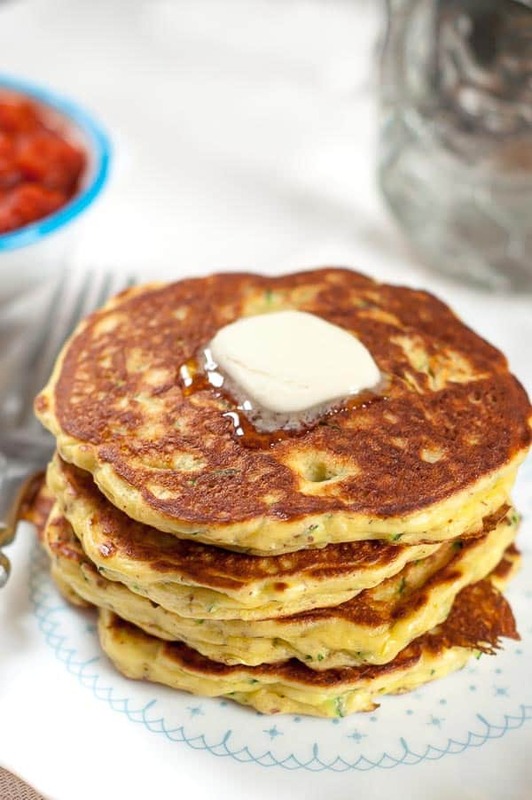 Skim milk may have to strain a bit longer to thicken, but is still equally delicious! Some tips for timing it out: Option 1 – Boil and cool the milk before bed and let it process for the 8 hours while you sleep. Option 2 – Boil and cool the milk first thing in the morning and let it process all day. Option 3 – Start in the middle of the day and let the yogurt strain overnight in the refrigerator. 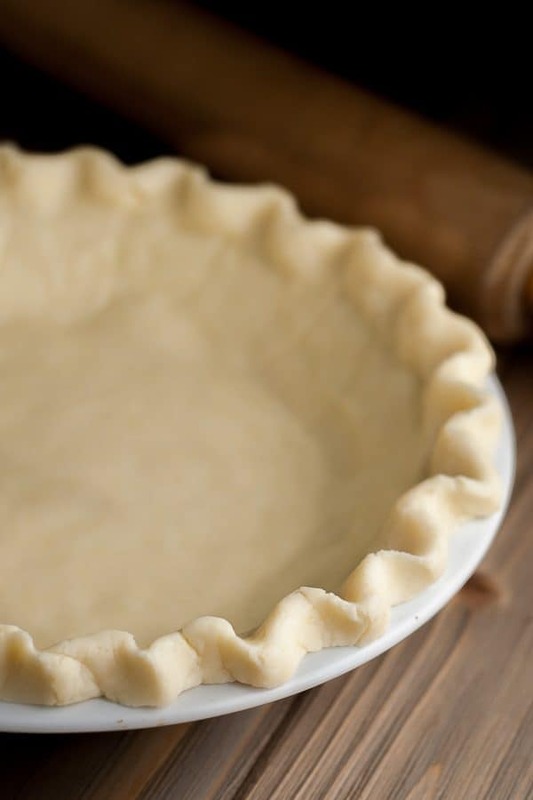 It will be extremely thick when you wake up, but you can always add some of the drained whey or milk in to thin it out. If you like your yogurt tangier, let it process for about 10 hours. How to know when your yogurt is done: It will look gelatinous and some of the whey will separate and be settled on top. If it doesn’t look like this, process for 1-2 more hours. 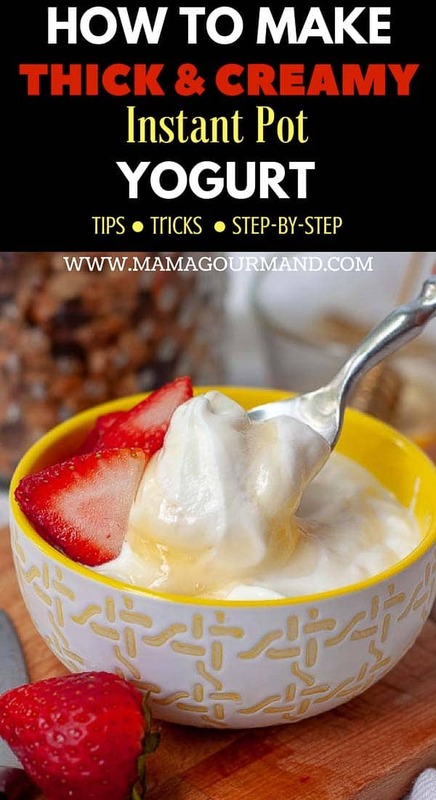 After the yogurt is strained you can whisk or beat it in a bowl to make it extremely creamy and smooth. Less is more when adding the starter. 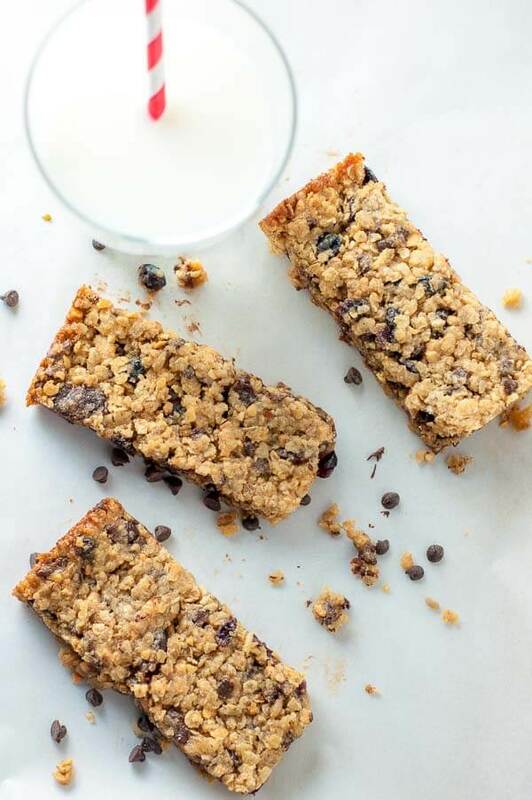 Don’t be tempted to add more than 2 tablespoons per 1/2 gallon of milk. 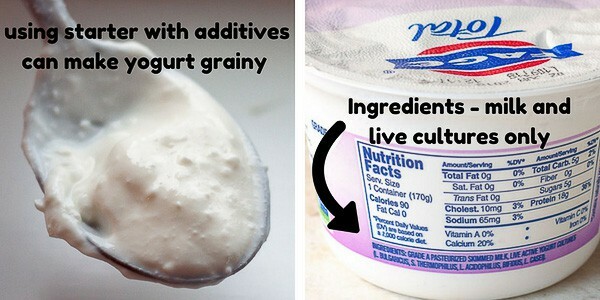 Extra starter can inhibit the growth of live cultures and might make your yogurt grainy. Trust me, you will forget about your yogurt straining in the refrigerator. Not a biggie, but it might end up thicker than desired. Adding the drained whey works for thinning it out. 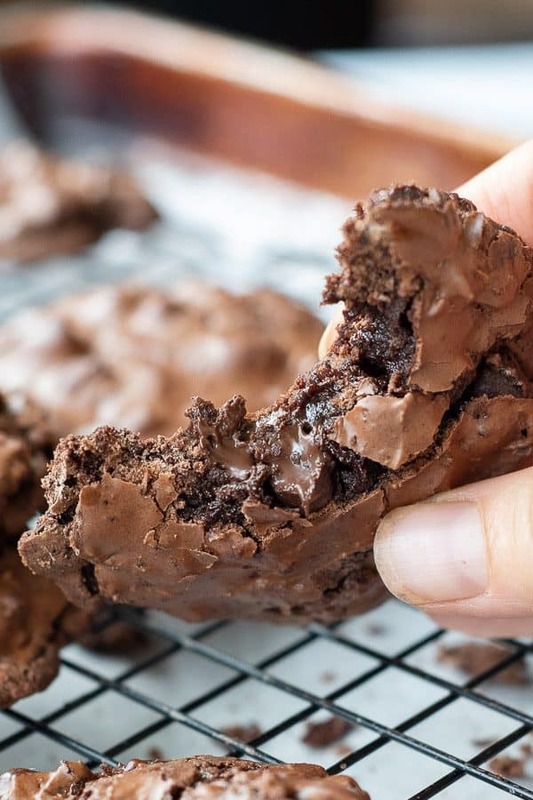 Alternatively, adding a little milk, coconut milk, half and half, or cream will make it even smoother and creamier tasting. 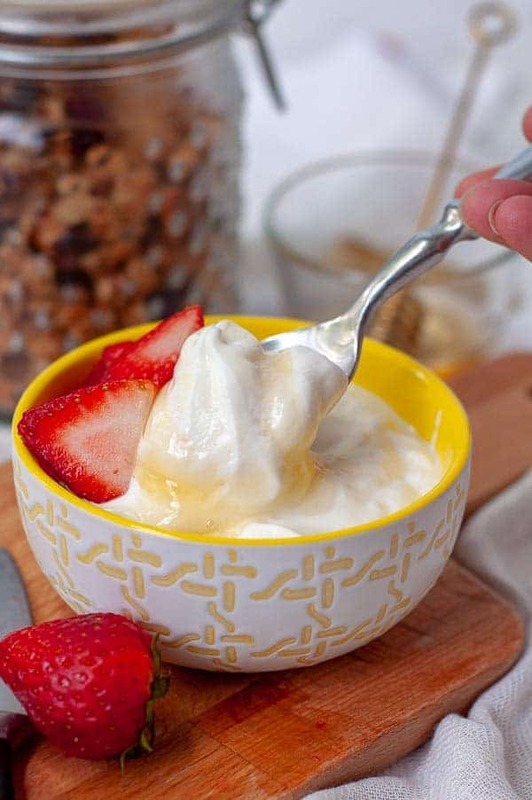 SAVE THIS HOME TO MAKE INSTANT POT YOGURT TO YOUR PINTEREST BOARD! How to Make THE BEST Instant Pot Yogurt recipe is an ULTIMATE GUIDE with all the tips and tricks for achieving the most mind-blowing homemade yogurt you'll ever taste. Incredibly easy-to-make Instant Pot yogurt tastes smooth, creamy, and decadent, like eating a bowl of whipped cream without the calories! Pour milk into Instant Pot and make sure valve is sealed. 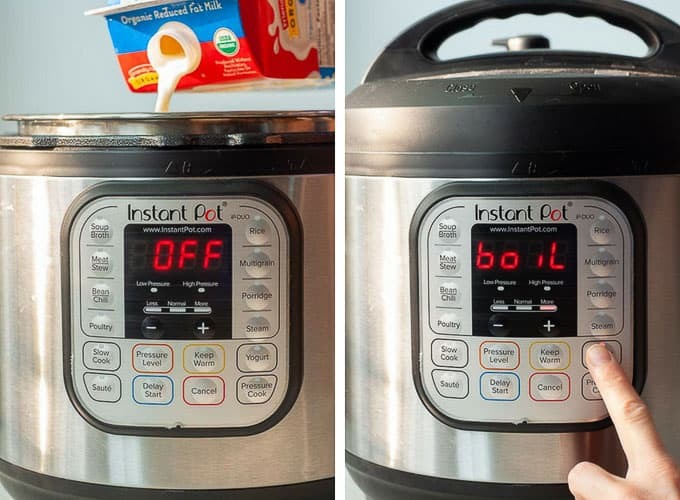 Press "yogurt" button until it reads "boil." It takes about 30-45 minutes for milk to come to correct temperature, 180ºF (82ºC). Once it's reached 180ºF, the Instant Pot will start beeping. Remove the lid and carefully remove insert. Set insert with milk on the counter for about 45 minutes to come to 110-115ºF (43ºC-46ºC), stirring occasionally. Alternatively, set insert in an ice bath and stir for 5 minutes, or until milk reaches 115ºF. Whisk yogurt starter into the 115ºF milk. Place insert back into Instant Pot and press "yogurt" button again until time reads 08:00. The Instant Pot will then change to 0:00 and count up until it reaches 8 hours. Line a strainer with one layer of cheesecloth and set over a bowl to catch the whey. Pour yogurt into the lined strainer. 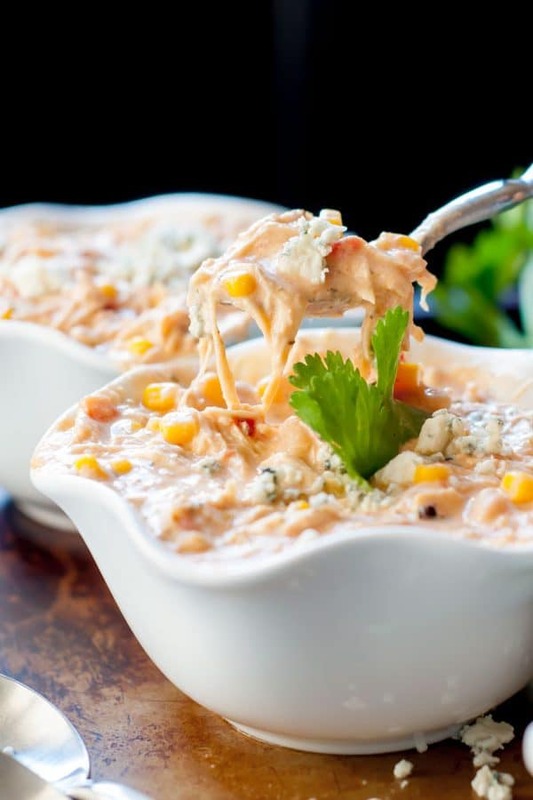 Place everything in the refrigerator to continue to strain for 2-3 hours for regular yogurt and 4-5 hours for "Greek" style. TIP: If you accidentally left the yogurt straining too long and it becomes thicker than desired, simply stir some of the liquid whey drained out or additional milk back into the yogurt. TIP: While yogurt is straining, you may want to use a silicone spoon to scrape cheesecloth and stir yogurt to make sure whey can still pass through. Yogurt will last 10-14 days in refrigerator. When additives are in your commercial yogurt starters, such as pectin, inulin, cornstarch, and gelatin, it can yield a grainy yogurt. Just made it but it came out looking like warm milk. Only thickness is about an inch on the bottom. You said if it wasn’t right, put it back in for 1-2 hrs so that’s what I’m doing. Hope it works!! Yes please follow up. I’d love to know! So this happened to my sister, but it turned out she never put in the yogurt starter (so basically she was just warming milk for 8 hours). If you are using skim milk or sometimes the yogurt cultures might not be strong enough, you can add 2-4 hours to the cooking time. Looking forward to hearing from you! Quick question. How much yogurt does the recipe yield using 1/2 gallon of milk? I’ve been toying with the idea of making my own Greek yogurt. It makes 1 quart. I save an old quart yogurt container and use it to put my homemade yogurt in. 1/2 gallon of milk fills it perfectly. Enjoy! Hey! 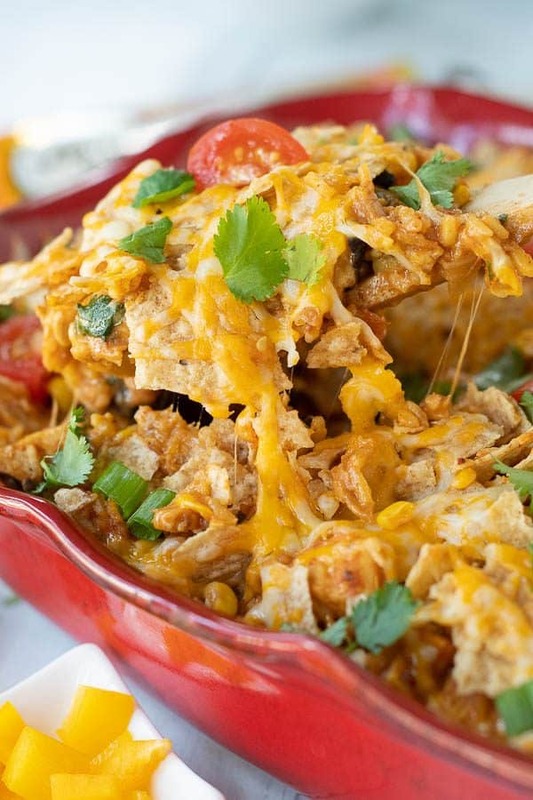 currently wanting to make it- trying to make it lactose free! (wish me luck!) but QUESTION! Maybe I missed it…. but do you have the valve set to VENTING or SEALED when you first boil it? and what about when it’s thickening? is the valve on VENT or SEALED? Definitely sealed and thank you for pointing that out! Please let me know how it turns out because I’m sure other readers will be interested as well. 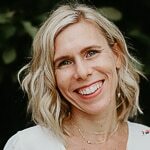 Best of luck, Gretchen! Anxiously waiting to hear about your results. I accidentally bought lactose free non-fat milk and this sounds like the perfect way to use It! I LOVE this! 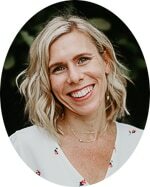 I just got an Instant Pot for Mother’s Day and I’m still trying to learn how to use it. I’m so excited you posted this. 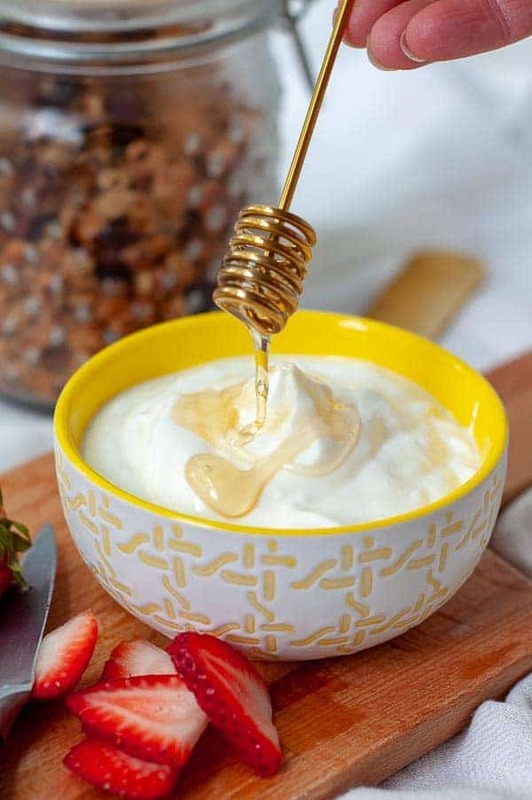 How cool to make your own yogurt! Thanks Michele! I was so blown away how good it was, I had to post it. 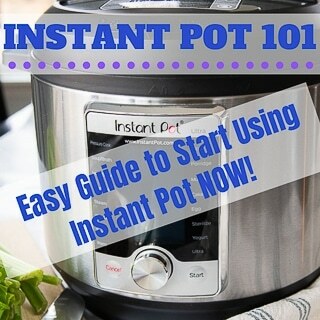 I want everyone who has an Instant Pot to give it a try. It ends up being so much healthier too since the taste is so mild, you don’t really have to add much sweetener at all.